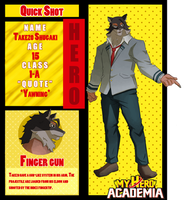 This app is for an amazing looking Hero Academia group!! Check it oouuuut! Evee, Eva, Peaches (by her cousin) Little Lily (ONLY by her dad). 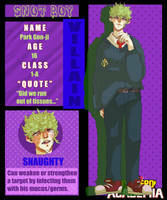 Villain | Eva works for her father's family business for villains, The Okajima Dantai. Doing missions, side jobs, and stealing items for the right price is just some of what they do. She's also the leader of a "gang" that works within the business. Her orange eyes and orange tipped hair are unusual in her family line. Her quirk demulsifies, or breaks down, any object that isn't in its original organic form (i.e. plants, water, animals) into its original organic mater (i.e. a book turns into pulp and dried ink powder.) and back again. Eva can control what size, locate where, and how much to break down, and she can reach locations up to 100 yards using fissurs to travel. depending on the density of the object, some things are harder to demulsify than others. if she uses it to much, her vision will will start to blur, if she continues to use it, her fatigue will become too much and she could pass out. If she uses it way past her limit, she'd be in risk of a coma. When she demulsifies something and emulsifies it (puts it back together) details that are not related to shape are lost. if she did it too a book, the pages and shape would be the same, but the ink would just be lines across the page instead of words. Eva doesn't know 100% how to control her quirk, so quirk-vs-quirk battles are difficult for her. Eva is basically quirkless if she tries to fight in a nature environment, since her quirk only works with man-made/touched objects. She runs out of stamina fairly quickly if she uses her quirk while chasing/running from people. If Eva gets too emotionally unstable, she loses control of her quirk. Eva likes to find the best way to approach her battles. She mostly uses stealth attacks, and uses her quirk to catch others off guard. although sneak attacks are her specialty, she was trained to take on close-range combat as well, though its not her strong suit. Eva rarely shares anything personal about herself, even to family. She often cold to the new people that she meets at her father's business, throwing them to the wind once a mission is complete. Eva takes trust very seriously, unwilling to trust just anyone that she meets. She always goes against what her father wants, going left if he says right. She does the same to anyone who she thinks doesn't deserve to be followed. Eva loves thinking outside the box, not letting the world that she works in dominate her way of thinking. She's always exploring new places, and not just for the sake of finding new places to make deals. The thrill of discovering new locations to hind and use her quirk excites her. Eva is very observant when it comes to how people act and move. She'll try and copy moves and fighting styles that she thinks could benefit her and her team. No matter big or small, if you get her mad, Eva'll want TO FITE U. If Eva doesn't get her way, no one does. She's stubborn like that. Its not that she looked down on others, its that she thinks they're looking down on her! And if no one wants to listen, she'll go off on her own. This determination runs through her veins, so its not something that can be changed over night. Eva almost ALWAYS speaks with SOME form of sarcasm in her voice, whether you hear it or not. The more vulnerable she feels, the more she uses it. Although she dresses nice and paints her nails, Eva acts very tomboyish. She loves insects and could care less if she gets a dirty, just not in her good clothes. Eva was born into a family of vigilantes in the UK, where she was raised with the belief that heroes were trying to mold citizens into what they want. She had a loving brother named Parker, whose only dream was to become a hero. because of the conflict in interest, Eva's father and brother fought constantly about who's right and wrong. Despite that, Eva enjoyed her life with all of them. But when she got older, she started seeing her father around less and less......it wasn't soon after that that she found out why. The family on her father's side, the Okajima side, was well-known in the villain industry. it was more like a corporation rather than a gang, and they exchanged things like information, allies, and weapons. His family always wanted her father to take over, but her mother was against it. After years of them persuading him to work for them, he began to work with them in secret from Eva's mother. Her mother found out four years later, and was not happy. After her parents had a long discussion, it was decided that both Eva and her brother were to move to japan for a year, and once that time was up her father would discontinue further communication with that side of the family. Her mother stayed, having memories of Japan that she'd rather forget. Parker would finish his last semester of high school there, and try to find a sidekick position, if he was lucky. They moved after Eva's fifth birthday, taking little with them. Eva went into training with her quirk, while her brother was able to find a apprenticeship with a local hero while he was finishing up school. Her parents had found out about her quirk soon after she was born, unlike her brother that took eight years. Everything was great for almost the full year, but fate took that happiness away quickly. Eva's father was planning a great act of villainy by kidnapping a few heroes to use their quirks... strong quirks. Things didn't go as well as they had planned, the whole thing turning into a huge mess of first fighting, and then a fire broke out, swallowing a few buildings. All the heroes that where close by tried to help anyone they could, Parker and his mentor being some of those heroes. They all went into the burning buildings, and they saved almost all the souls inside. 'Almost' because when they did a head-count, everyone was there, minus Parker. His mentor tried to convince the others that the kid probably got scared and ran off, but they found the truth once they inspected the buildings after the fire. He was the only one lost from that incident, and Eva was mad. 'Why didn't they save my brother?' was all she could ask with no one able the give her an answer. Her father cut all communications with her mother for an unknown reason, and he refuses to tell Eva where her mother is. So, she grew up in japan with her cousin Roslyn taking care of her, and besides the frequent questions that Eva asked about her mother, she was healing from the loss of Parker. That lasted until Eva saw a video of what had happened a year later, her cousin finding it on tape locked in a volt. Eva didn't know that it was her father's fault for this tragedy in the first place, and didn't know what to do when she found out. Everything she thought she had left was a lie. Eva wasn't only in disbelief that her father hid that from her, but that during the accident, none of the heroes even went looking for her brother, even though they saw him go in with them. Hours had gone by, and no one even glanced back. Eva had changed that day, barely eating or talking to anyone, including her father. Not only was her relationship with her father on the way out the door, but Eva hated heroes with every once of her little six year old soul. From that day forward, Eva promised herself that she'd make ALL heroes feel what she felt, seeing those with the potential to help you walk right by you, ignoring your existence. She started taking training seriously, and had trained everyday for the last 10 years just to accomplish the goal she had set for all heroes: they will learn what its like to be a nobody. Eva was born in the UK. Occupation: former vigilante and healer, location unknown. Occupation: former heroes apprentice, Deceased. Quirk: Luck be a lady. Occupation: works at a bar/casino exclusively for villains. She is like a sister to Eva, them being raised together since the accident. Eva's family is pretty well-off, and her father owns hq's in many different parts of the city. Eva was short for most of her life, then got a sudden growth spurt. She plays with her hair a lot when she's bored. Eva love fruity anything (drinks, foods, desserts, ANYTHING). Her brother was really interested in ships and used to build modals of them. Eva keeps them above her nightstand. Eva got her fashion sense from Roslyn, and is always up to date on the latest trends. She still has trouble writing kanji, since Japanese was her second language. Eva collects key-chains, cute or weird! If Eva is busy, she'll often forget to eat, thus her eating schedule is trash. Eva rarely talks to her father anymore, and addresses him as 'Boss' when she does. format: I do mostly Para and hc!